This page is a catch-all for updates/addons to my Video Peggy project. The basic project consists of hardware and firmware mods to the Peggy 2.0 kit to facilitate low-rez streaming video from an outside source (such as a PC). If you're not already familiar with this project, you should probably review the pages for the original hardware-mod version, as well as the improved "no-mod" version (all the cool videos are on those pages). Client code from this page will work on either version. All of the videos that I had previously posted demonstrated used Quartz Composer as a source. In order to make that work, I had to create a QC Patch that could take a bitmap and render it out as a stream of bytes to a serial port. I'm making the code for the QC patch available under a GPL license. Quartz Composer Serial-to-Peggy2 Plugin Source. Requires XCode 3.0 or higher on OS X 10.5 (Leopard). This code should be considered experimental, and may have nasty bugs. Please read the README for more information on how to use the patch. Processing is an "open source programming language and environment for people who want to program images, animation, and interactions". Based on Java, it is cross platform. The libraries are high-level, easy to use, and fun to play around with. Looking for a cross-platform way to send data to a Peggy rather than the OS X-only QC solution, Processing was an obvious choice. Still pictures of the bouncing circle just don't do it justice. I didn't put the effort in to write a library for Processing, but what follows are instructions for modifying an existing sketch to send output to a Peggy running the "Video Peggy" firmware. This code is currently a bit inefficient, I'm open for suggestions on how to improve the performance..
// be sure to use the correct serial port name below or the sketch will hang! // render a PImage to the Peggy by transmitting it serially. 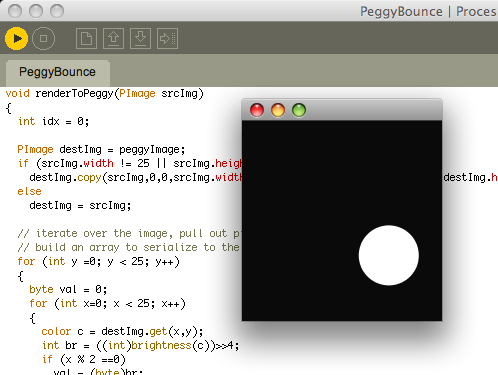 you can then add some code to your draw() method, calling renderToPeggy() with a PImage that you want it to display. // of the current processing display. TODO: Add more client code examples. C# maybe?